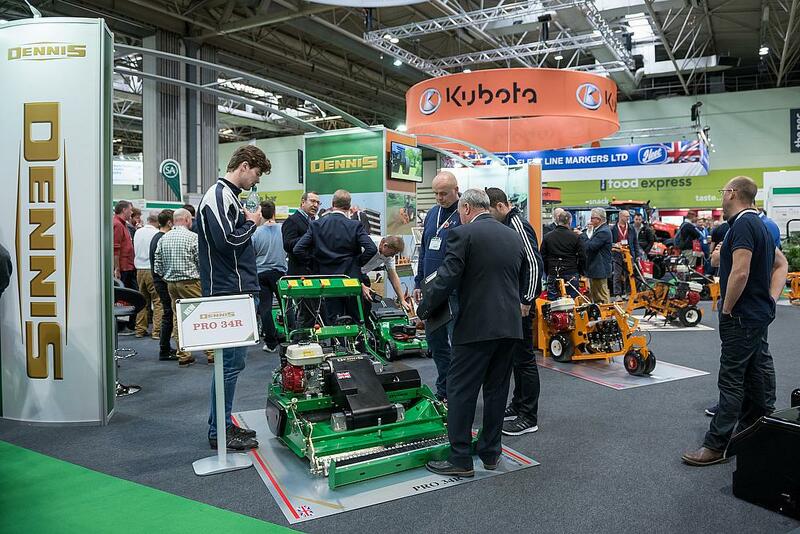 A visit to the Dennis stand on E070 at IOG SALTEX 2018 will show how the company’s range of world class turf maintenance equipment enables turf professionals to benefit from cutting edge technology. Taking centre stage on the Dennis Mowers stand will be the new PRO 34R rotary mower. Following the launch of the prototype model at last year’s show; the professional rotary mower has been refined and developed with feedback from groundsmen over the past 18 months. The PRO 34R is a 34” (860mm) rotary mower designed to help groundsmen achieve an aesthetically pleasing appearance and desired playing surface. The mower is ideal for sports pitches and lawns producing the enviable ‘Dennis Stripes’ while a powerful vacuum flow collects debris quickly and efficiently. The angle of the cutting deck and twin blades can be easily adjusted using a single ‘click adjuster’ ensuring the mower is suitable for changing conditions and meeting groundsmen’s requirements. Also on view will be the G860, G34D and the Premier professional cylinder mowers along with the the FT510, Razor Ultra, and S500 Plus seeder, which creates ideal seed germination pockets whilst reducing seed wastage. The FT510 professional mower is unrivalled as a mower and turf maintenance machine on all areas of fine turf. A cutting width of 510mm (20”) and a range of 11 interchangeable cassettes mean that one machine can be used for several different jobs from scarifying, verticutting, brushing and cutting. The Razor Ultra 560 has been developed to specifically meet the demands of cricket pitches as well as golf greens & tees and bowling greens. The machine has a 560mm (22”) cutting width and incorporates many key features including an 11 bladed cutting cylinder, ultra short wheelbase for undulating surfaces, tungsten tipped groomer, compact handle design for extra manoeuvrability, click height adjusters and stub free transport wheels for easy transport from site to site. The G860 has eleven quick changeover cassette options giving ultimate flexibility and a single power unit for many day-to-day maintenance tasks. This versatility coupled with low ground pressure, at just 166kgs, and manoeuvrability makes the G860 the choice for many top sporting venues around the world including the recent FIFA World Cup Finals in Russia. Designed and built following the same concept as the Dennis G860, the G34D is a dedicated cylinder mower that incorporates a large-diameter eight bladed cutting cylinder to cater for a wide range of uses to leave a precise cut. Fitted with either a powerful Honda Petrol or Kubota diesel engine, the Premier is available in 30” and 36” cutting widths. A 3 section rear roller and steering brakes make it easy to manoeuvre giving an excellent stripe pattern and rolling characteristics. Complete with a large diameter front roller with adjustable scraper, for precise height of cut control, the machine is easy to adjust on both sides with the use of a single spanner. In addition to the range of Dennis products on show, the combined display with SISIS will also show a range of natural and synthetic turf maintenance machinery. For more news, reviews and insightful views, you can follow Dennis on Facebook, Instagram and Twitter @DennisMowers. You can also view the latest Dennis videos by visiting www.youtube.com/DennisMowers.